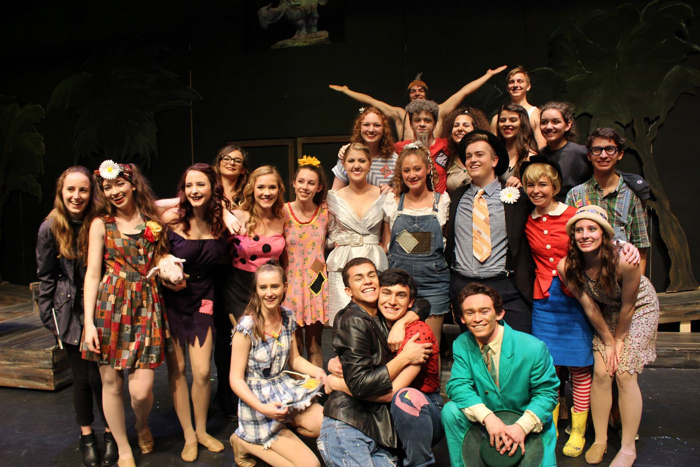 Based The Academy for the Performing Arts at Huntington Beach Union High School has scored once again with the enormously funny classic musical, �Li�l Abner!� The show played in the Studio Theatre the weekends of January 13-15, and the 20th-22nd! Li'l Abner is a stage musical with a book by Norman Panama and Melvin Frank, music by Gene De Paul, and lyrics by Johnny Mercer. Based on the comic strip Li'l Abner by Al Capp, the show is not only a sidesplitting broad spoof of a hillbilly community but it is also a pointed satire on other topics, with amusing political jibes of Trump, Sarah Palin, Bernie Sanders, and even some southern California pokes � all in good fun. Way back in 1934, the Li�l Abner cartoon strip captivated the nation and began to appear regularly in the Sunday Comics in most newspapers. Fast forward to 1955, and we find Al Capp making a deal with Paramount Pictures to include a film version as well. Meanwhile the comic strip was musicalized into a Broadway stage version by De Paul and Mercer, who had previously written the score for the popular movie musical, Seven Brides for Seven Brothers. Li�l Abner ran for a successful 693 performances, receiving much critical praise. In Dogpatch, U.S.A., it�s �A Typical Day� as bombshell Daisy Mae, sweetly played by Darla Jacobs, is trying to convince Li�l Abner Yokum to be her beau. Handsome Abner (Sam Melvin) has no interest in girls or getting a job, so Mammy (Lindsey Campbell) tells Daisy Mae to find Abner and get him to come to the Cornpone Meetin� in the center of town. Abner is content with his simple life and enjoys fishing with his friends (�If I Had My Druthers�). Daisy Mae arrives soon after to tell the boys about the meeting, and they head into town. We meet Marryin� Sam� Sam is a traveling preacher who mostly specializes in $2 weddings. He also offers the $8 "ultra-deluxe speshul," a spectacular ceremony in which Sam (charismatically played by Marcus Veyette) officiates while being drawn and quartered by four rampaging jackasses. He cleans up once a year during Sadie Hawkins Day, when slow-footed bachelors are dragged kicking and screaming to the altar by their prospective brides-to-be. Strong worthy mention of Sam�s vocals here: They are good! At the Cornpone Meetin�, Senator Phogbound, a.k.a. Damon Williams, who is a blustering, corrupt southern politician, announces that Congress has decided Dogpatch is the most unnecessary town in the country and will therefore become a testing site for a nuclear bomb. The town is thrilled that it has been recognized for any title at all (�Rag Offen the Bush�). However, Earthquake McGoon (William Boyer-Montgomery), whose main objective is to wed Daisy Mae, brings up the fact that if they all have to evacuate Dogpatch, they will be unable to hold the annual Sadie Hawkins day race. This race is the only way anyone in the town can get married. Everyone finally agrees that Sadie Hawkins Day is worth saving the town for, so they plan to prove that Dogpatch has some necessary qualities. Daisy Mae finally accepts Earthquake�s conditions to allow her to catch him on Sadie Hawkins Day. Meanwhile, Daisy Mae manages to make Abner realize that she should be with him (�Namely You�). Reality sets in and the town begins to reject the idea of being an �Unnecessary Town.� Mammy Yokum, reveals that it is her Yokumberry Tonic that has given Abner his perfect all-American looks. Abner takes the tonic to Washington to make a case that there is something special about Dogpatch. Greedy General Bullmoose, characterized by the talented Adrian Villegas, hears of the potion and wants it for himself. He schemes to have his very alluring girlfriend Apasionata Von Climax (Dorothea Seibert Von Fock) catch Abner on Sadie Hawkins Day, and then kill Abner once they are married so she will inherit the formula. Abner returns home and assures everyone that �The Country�s in the Very Best of Hands.� General Bullmoose, Apasionata, and their cohort Evil Eye Fleagle, who is deviously played by Andy Jacobson, arrive just in time for Sadie Hawkins Day and the women begin chasing the men in the annual race. Daisy Mae nearly catches Abner, but Apasionata manages to catch Abner first. After the race, 17-year-old Daisy Mae is worried that she failed to win Abner because she is not young and beautiful enough (�I�m Past My Prime�). Mammy Yokum has a vision of Bullmoose�s plot to kill Abner and asks Daisy Mae to head to Washington to save him. Daisy Mae requests that Earthquake accompany her and agrees to marry him if he does. In Washington, Bullmoose decides to not have Apassionata marry Abner, but instead conspires to use Fleagle�s evil eye to steal Abner�s secret and then convince him to commit suicide (�Progress is the Root of all Evil�). Mammy and Pappy Yokum (Coleton Ray, who incidentally gave a remarkable performance) arrive with Daisy Mae and Earthquake to stop him, and Earthquake inadvertently bounces the beam from Fleagle�s evil eye with a mirror back to Bullmoose, who is forced to confess and carried off, still stiff as a board. The women of Dogpatch head to Washington where their guinea pig husbands have been test subjects for the Yokumberry Tonic, led by scientist Dr. Rasmussen T. Finsdale, played by Michael Krisel. They find them transformed into strong, virile specimens, but unfortunately the men no longer have any interest in their wives. The women ask the Doctor to �Put �Em Back� to the way they were. All in all, �Li�l Abner� is a rompin� good hoedown. Many standouts in addition to those indicated include Sophia Courtemarche as Stupefying Jones, Austin Schulte is Available Jones. Austin Skaggs performs as Romeo Scragg, Dylan Schmoll as Mayor Dawgmeat, and Mollie Hersh plays Moonbeam McSwine. Freddy Buchannan is Lonesome Polecat and Trey Burr is Hairless Joe. Kudos to the entire ensemble, too numerous to mention individually, but it is plain to see all are brilliant and have been stage-trained well. The technical staff and production crew were perfect in all respects; costumes by Carole Zelinger and Debra Klingensmith, and choreography led by Diane Makas and Jennifer Simpson-Matthews. Directed and musically directed by Tim Nelson, the pre-show features hors d�oeuvres served by costumed students from hill country, and who soon became part of the 15-minute entertainment, dancing and singing flawlessly in perfect step. As an official fundraiser for the season, the focus was on the vast quantities of baskets and prizes available for auction and raffle. Proceeds will serve to benefit many capacities needed in APA�s MT department and Theatre Guild.